It's a bird! It's a plane! 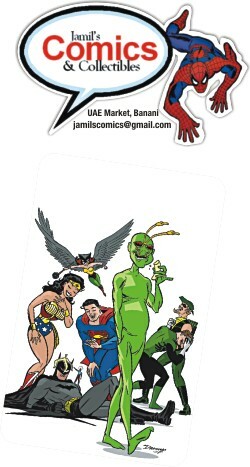 It's a silly old green bug flying off the comic book panel! Welcome to the world of Ambush Bug. He says his name is Irwin Schwab, but we can't be sure. Ambush Bug has proven that he is not to be trusted, is almost certainly mentally unstable, and has refuted his own statements about himself many a time. He wears a green suit, with a couple of orange antennas sticking out in his head. He can teleport, apparently using nano-robots in his suit (but he has shown he can teleport without the suit as well). One thing is certain, when he is around, especially if his creator the great wacky Keith Giffen writes the stories, things cannot be dull. Ambush Bug has had very good success in the mid 80s, appearing in Superman stories. He was given his own Mini-series in 1985 with great response. This was followed by his second mini 'Son of Ambush Bug' in 1986, which unfortunately did not do so well. Seen as a joke, the bug has rarely been written by other writers than Giffen, which is a shame. The potential has always been there. Superhero comics sometimes need escape. In the old days, there were characters like the Bat-mite, the Impossible man and Howard the Duck that could have and should have been used more in the Comics. The Bug was right in telling the Sandman/Dream that he did not have a sense of humor and could not appreciate life. Ok, so Dream did dump him in the real world, drenched in tar and feathers afterwards, but the Bug is still right. I mean, who else can you envision playing chess with Darkseid? During the haydays of the Secret Wars of Marvel, when Spiderman first donned the black costume, Giffen paid a homage by making the Bug black. The excuse? Ambush Bug found one of his nano-robots/bugs out of order. Trying to fix it, he destroys it, and starts a chain reaction which destroys the rest of the bugs in his suit, tinting it to black. Now, if that isn't great storytelling, what is? Seriously though, the superhero comics world does need to lighten up sometimes. A good comedy is always harder than a good tragedy. I don't mean a return to the “Pow! Zapp! Kazang!” days of comics, but you know what I mean (I hope). Here's to you bug. Waiting for you to make a grand return. The piece was chosen for its mythical tone and the well executed storytelling. Next week we have 'Emergency Exit' as our topic. All submissions need to be sent in to ds.risingstars@gmail.com by Sunday noon. Word limit: 350-500 words. Good luck. She stood a few feet away from it. Yet, it seemed far away, like a forgotten dream. Her heart throbbed as she took a step closer. She tried to block away her trepidation but it battered her like the people passing by her. But this fear was not for the thing at which she looked, but of the temptation she was having, an impulse to own this long cherished object. It had a polished mahogany case with a leather strap, or so it seemed to the normal eye but to her it was gold. It was quite flat and rectangular in shape. The golden inscriptions it had on its top suggested it was from some renowned brand which she did not have the time to find out. It was beautiful and a sign of opulence. It must have at least twenty rainbows crammed into it. A light seemed to shine on it as if it was a piece of the heavens itself. The box itself seemed to radiate warmth equal to a thousand suns yet as mild as that of a firefly's flame. The girl herself felt as if she was already a goddess, a sign of beauty and fame. Idolized by every girl like herself. This magic box could do it all with its power. She took another step. It seemed like a thousand harps where playing. The boys she cherished everyday where already at her feet. Her legs shook under the weight of such dreams. She clenched her fists so hard, that they hurt under the pressure. She took another intrepid step towards the box. She could almost smell her heart burning with desire. It could be hers. She knew what to do. Only two more steps. She took one. Just one more. She bit her blood red lips. Her fingers were already intertwined in each other, trying in vain to fight off her anxiety. It was not as if it would cause her any harm. After all it was just a box. She took the final step. Even if she knew that her better self had been desensitized she did not care. It was only the box now, her only way out of this insipid life. No moral conviction remained in her , no care about the rest of the world .The boxes evil had diffused into her heart . She reached towards the box but no longer painfully, it was a conditional reflex, something she did not have a control over just like the rest of herself. She opened the strap by the help of the dim candle light but knew that her fingers would have done the same without it. Then pushing the lid back, Pandora opened the first make up box in the world.